My new thing seems to be making Sunday dinner at home. Is this a sign that I've been watching too much Jersey Shore? Either way, I've come to enjoy scouring recipes during the week and planning my menu for Sunday dinner. Most recently, I stumbled upon an excellent seafood recipe on Food Network courtesy of Giada de Laurentiis. Super easy and super impressive, I'm pretty sure this dish is going to become a new Sunday dinner staple in my kitchen. I hope you will enjoy it too! First step is to prep the seafood. I've become an avid fan of Fresh Direct and not only is it easy to gather my groceries (its a one stop pick-up with my doorman! ), but the quality of seafood I think is excellent! Based upon what shellfish was available and its current pricing, I ended up with about 2 1/2 pounds of mussels, 12 Littleneck clams, and half pound of medium shrimp. 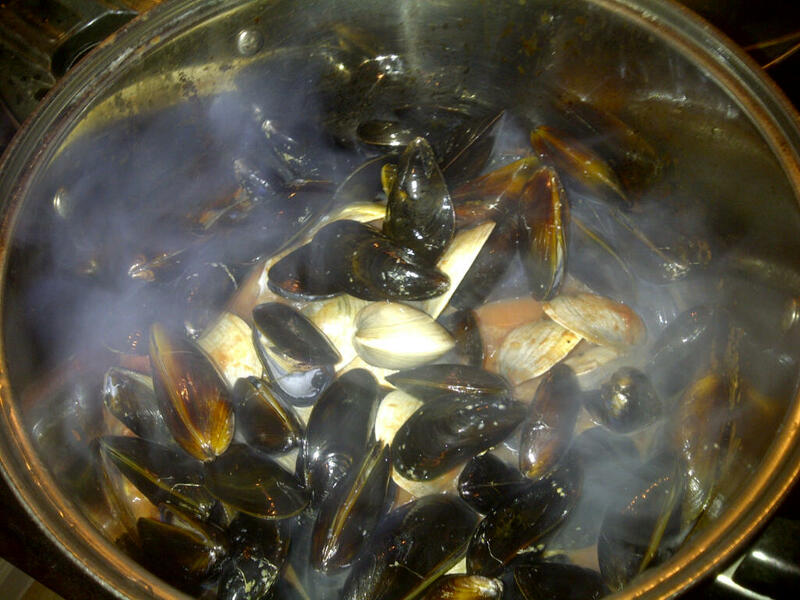 Soak the mussels and clams in cold fresh water for about 20 minutes. During this time, the clams and mussels will be spitting out any sand and grit they have stored. 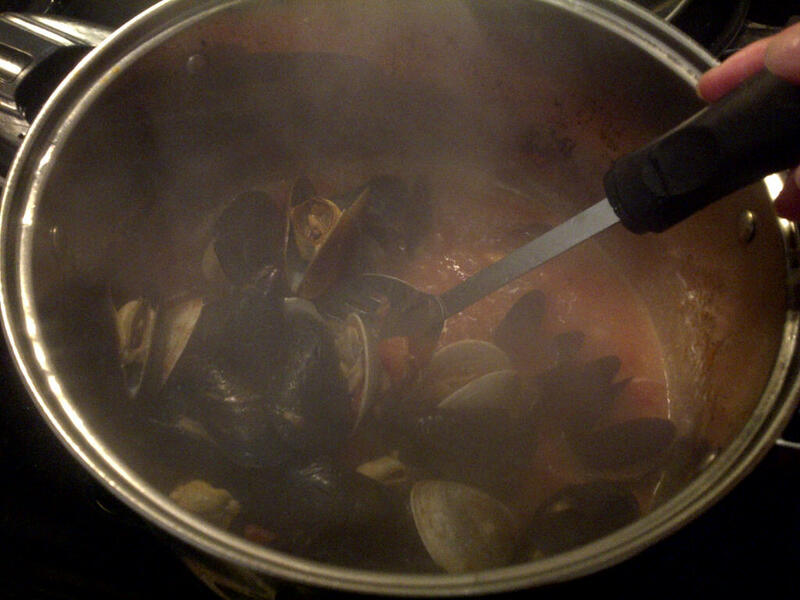 After 20 minutes, scoop the clams and mussels into another bowl of clean water. Don't dump them through a strainer as you may just end up pouring the sand and grit right back on top of the mussels and clams. Using a firm brush, clean off any barnacles and remaining sand from the shell and remove the beard from the mussels (the beard looks like small threads coming from the shells - you can give it a gentle tug towards the hinge of the shell or trim them with scissors). 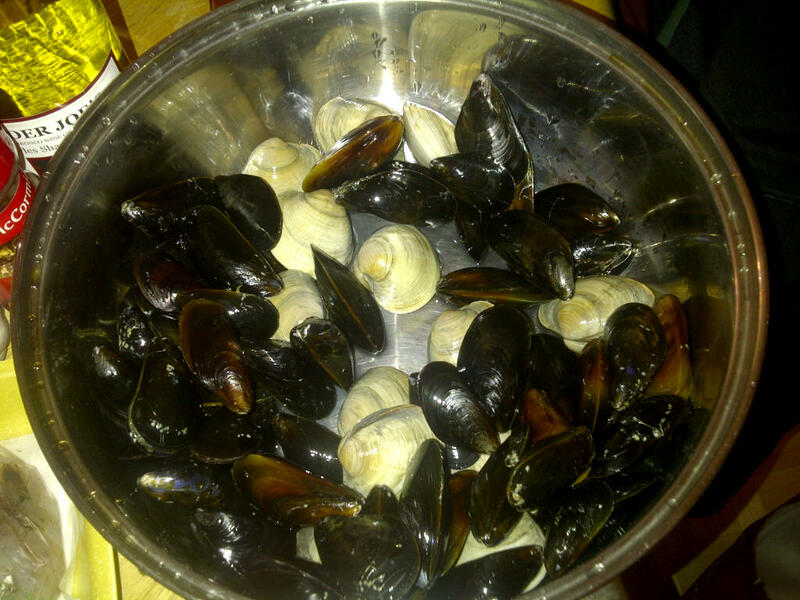 Discard any mussels and clams that are chipped, broken, or open. Note that sometimes the mussels may be sleeping and so their shells are slightly open. You can check if this is the case by gently tapping it against the table - if it is sleeping then the tapping will wake it up and its shell will shut tight right away! My shrimp came peeled and cleaned so I just gave them a quick rinse. Once you've prepped your seafood, go ahead and heat up the oil in a large pot. Add the garlic, crushed red pepper, and bay leaf. I added an extra 2 teaspoons of crushed pepper and a couple more garlic cloves to give it extra kick. Saute until the garlic is tender - approx 1 to 2 minutes. 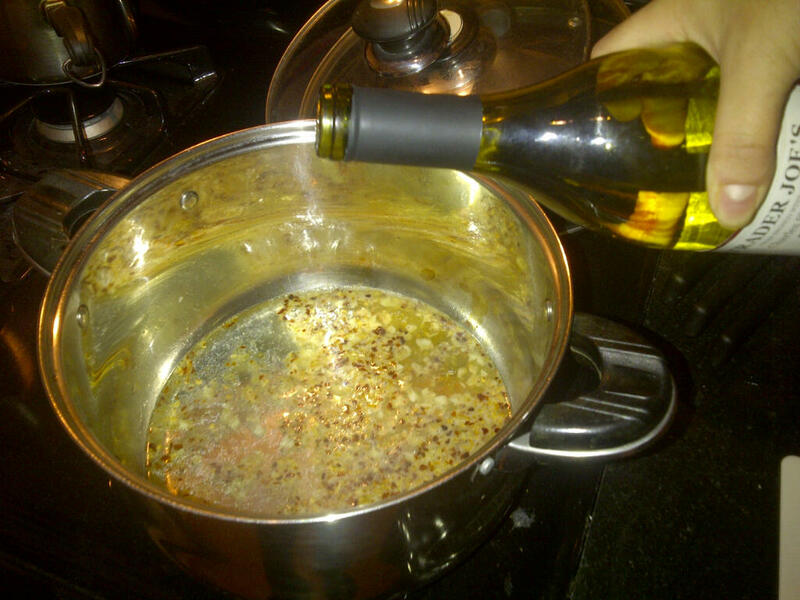 Add the wine and bring to a boil. 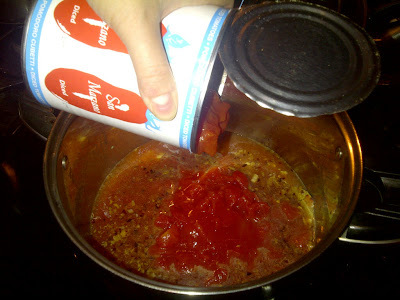 Then add the tomatoes and simmer for about 10 minutes. 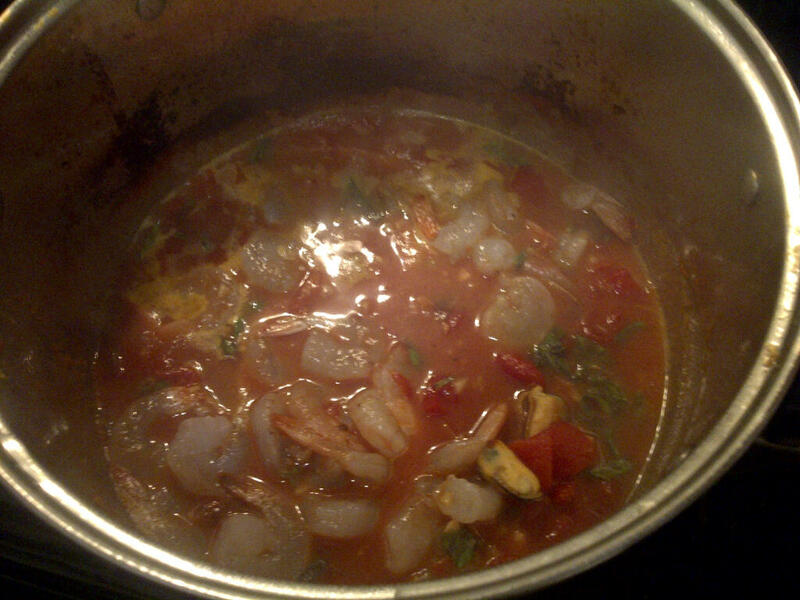 Stir in the clams, cover the pot and let steam for 5 minutes. Follow with the mussels, cover the pot and let both steam for another 5 minutes. 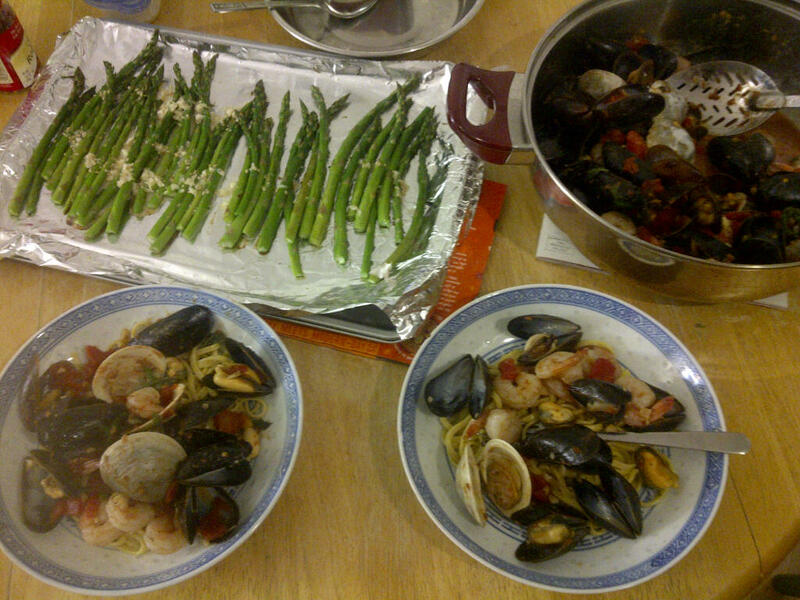 At this time, all the mussels and clams should have opened! 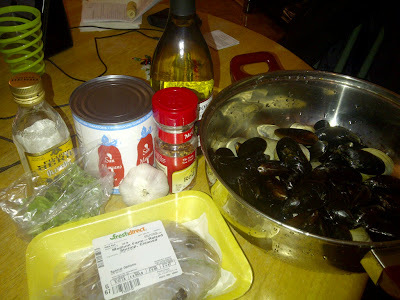 Gently transfer the mussels and clams to serving bowls or pot. Add the shrimp and basil and let simmer until the shrimp are pink and cooked through, about 2 to 3 minutes. 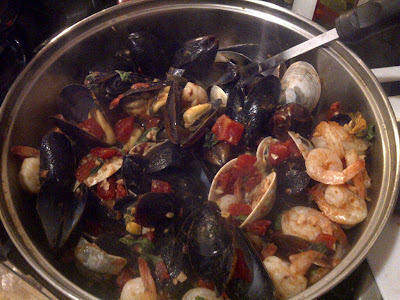 Either divide the shrimp and broth into the serving bowls or pour it over the mussels and clams in the serving pot. Serve with crusty bread (as the recipe recommends) or with some fresh pasta! 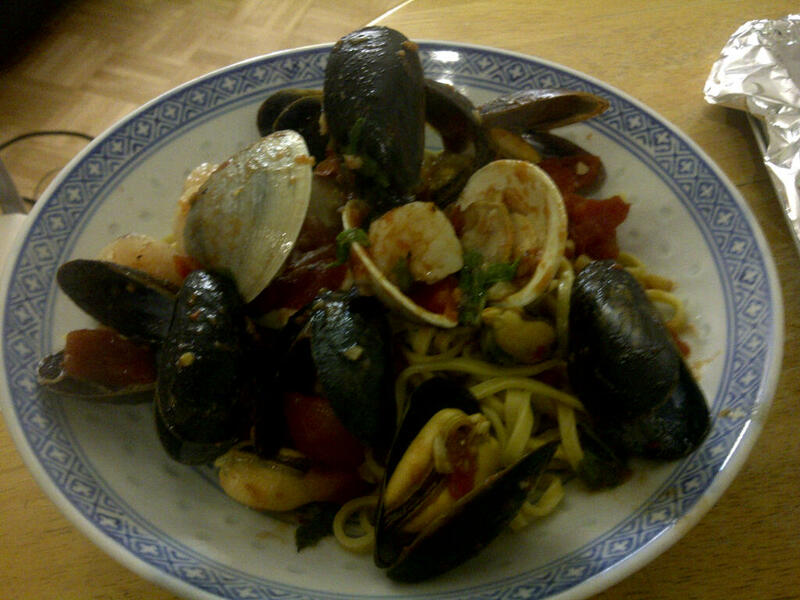 I served over a bed of fresh linguine and it was DELICIOUS! This dish is pretty forgiving so feel free to experiment with adding other seafood such as scallops. And don't forget a side of veggie! Enjoy!